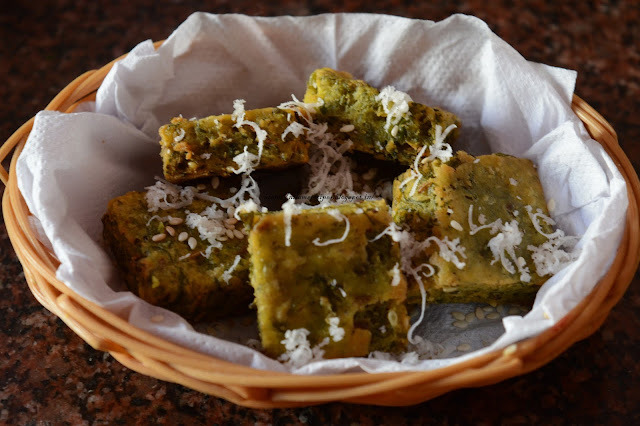 For similar recipes, check: Palak Vadi Recipe, Kothimbir Pakhadi Recipe, Matar Bhajiya Recipe, Kobichi Vadi Recipe, Pudachi Wadi Recipe, Suralichi Vadi Recipe, Kothimbir Vadi Recipe. Grind sliced onion, coriander powder, cumin powder, ginger, red chilly powder, green chillies and make a course paste. Boil matar and grind to a coarse paste. Grate boiled potatoes, add matar paste, onion masala paste to it and mix well. Heat oil for tempering, add mustard seeds and asafoetida. Now add matar-potato mixture and sauté for 5 minutes on a low flame. Cut them into square shape. Take semolina in a plate, coat patwadi in it. 1) Grind sliced onion, coriander powder, cumin powder, ginger, red chilly powder, green chillies and make a course paste. 2) Boil matar and grind to a coarse paste. 3) Grate boiled potatoes, add matar paste, onion masala paste to it and mix well. 4) Heat oil for tempering, add mustard seeds and asafoetida. 5) Now add matar-potato mixture and sauté for 5 minutes on a low flame. 6) Now pour the batter into a greased plate and let it set for 10 minutes. 7) Cut them into square shape. 8) Take semolina in a plate, coat patwadi in it. 9) Heat oil for frying. 10) Shallow fry them and serve hot.